Take a look at these [tag]basketball defense drills[/tag]. These [tag]basketball drills[/tag] can work with all age groups. Try these with your team and watch the improvements! Place two large cones at the elbows. 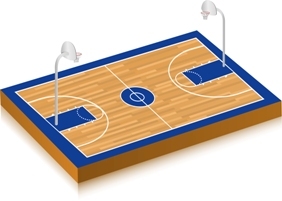 Place a [tag]basketball[/tag] on top of each of the cones. Start the offensive player between the top of the key and the center circle. The defensive player hands the offensive player the ball. Once the offensive player has the ball, they play one on one. The defensive player must force the offensive player outside the cones while the offensive player is trying to tap the balls off the cones. If the defensive player succeeds, he goes to the end of the line, and the offensive player becomes the defensive player. If the offensive player wins by tapping the ball off the cones, the defensive player must go again (he gets three opportunities to stop the offensive player). If he doesn’t get a stop at least one of the three he has a suicide (line drill). Purpose: Defending the paint and keeping ball handlers off the elbows on direct drives.